This time of year, we traditionally think about our goals for the coming year. And even though New Year’s resolutions get a bad rap, I think it’s a fantastic tradition to revisit your vision, habits, and goals, and set some intentions for what you want to improve. There are plenty of gurus who encourage you to hustle, grind, and smash your way to the next level of where you want to be. If that works for you, go for it. If it doesn’t work for you … you have a lot of company. You might find it useful to set a different kind of goal — a goal that focuses on how you want to think or feel. You could even set a goal to embrace different kinds of problems. Here are some thoughts for goals that can help you create more meaning and richness (and, yes, success) in the coming year. There are lots of intriguing studies that show that the way we think about something affects our behavior around that thing. If what’s going on in your life doesn’t excite you, it may be because the behaviors you’ve been putting in so far haven’t been up to the task. And if your behaviors are the issue, how you think about them is the first way to make them better. If you have what researcher Carol Dweck called a fixed mindset, you’ll tend to aim for easy, “safe” goals that don’t really excite you. And you’ll have a lot of unhelpful notions about things you couldn’t possibly do, because you lack the talent or you “just aren’t cut out” for them. That mindset is telling you lies. If you have a big dream but it scares you to even get started, you may find that cultivating a growth mindset can give you the energy and courage to move forward with it. You’ll spend more time out of your comfort zone (even just a tiny bit outside), and that can make all the difference. Growth mindset is what fuels those annoying people who don’t start out with all that much talent, money, brains, or innate ability — yet who seem to rocket past us while we’re trying to figure out how to get motivated to write that big blog post. And the coolest part is, any of us can start to adopt more of a growth mindset anytime we want to. Fixed mindset isn’t the only unhelpful way to think about our goals. You may be holding yourself back with common fallacies like all-or-nothing thinking or impostor syndrome. Next year, consider changing how you think about the challenges and opportunities that come your way. You may find that a relatively minor mindset tweak has a big payoff. So many people write the same resolutions every year. I want to land a prestigious job. I want to be the same weight I was when I was 11. We want to feel important. We want to be admired. We want to feel like we’re Doing Life Properly. Maybe this year, we can admit that, in fact, it’s wonderful to feel like a big shot. Confidence feels amazing. Maybe instead of (or in addition to) giving up smoking, sugar, and getting into fights on Facebook, we could give up being ashamed of wanting to feel like we matter. _____________________ is allowed to want to feel important. They are also allowed to take significant, or even heroic, action in order to get that result. There’s nothing wrong with it, and the desire to feel important is natural and healthy. Now, some good research has found that the very best way to feel important is to make a meaningful change in the lives of other people. Not because it’s more “virtuous,” but just because it works better and lasts longer. Your business, project, or side hustle probably has the capacity to produce a wonderful change for other people. That’s what most successful business is all about. Consider exploring that, and chasing the confidence that comes from helping others make their own meaningful changes. And if you do that because secretly you’d love to feel more important? I’ve got your back. What are the “high-quality problems” I want to have? That big business goal you have for 2019? To get your business to the next stage, or double your fees as a freelancer, or see tons of traffic and influence coming to your site? All of those are going to come with new sets of problems. Being busy and successful generates problems. I think it’s wise to treat balance, self-care, and perspective as goals, too. But you don’t need to let fear, stress, or “high-quality problems” keep you from trying to do something amazing. Business is creative, frustrating, intimidating, challenging, and, yes, stressful. So is parenting. And making art. And running a nonprofit. And writing a book. And competing seriously in a sport or other activity. A meaningful life is full of high-quality problems. 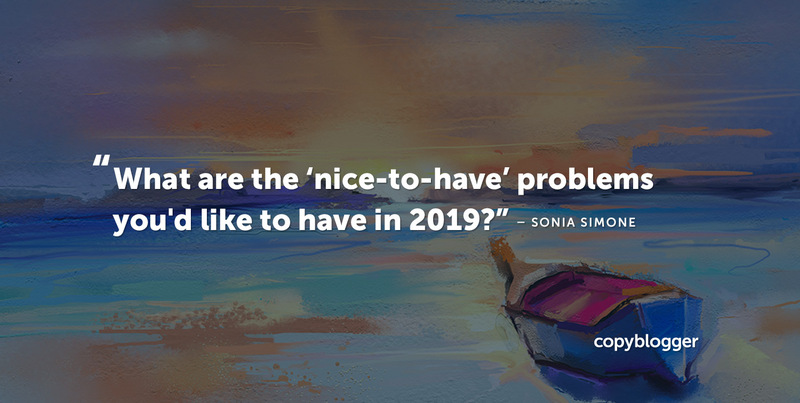 What are the nice-to-have problems you’d like to have in 2019? I’d like to have too many book reviews, some of them awful. And I’d like to have to spend too much money on editing those books. That would mean my work was getting published AND read. Great post, Simone. Thanks for the inspiration. Happy Holidays and see ya in 2019. “Some of them awful,” great insight. 🙂 Truly one of those problems that goes along with accomplishing great things. Deadline everyday for a column at a big magazine. Be that as it may, life isn’t partitioned into oversimplified “good and bad. I’d love to sell so many books I have trouble keeping up with the rave reviews 😉 Love this approach – changing how I feel about things is my big goal for 2019. My big, bold, audacious goal for 2019 is to make 2019 my best year. It’s the year I intend to ditch comfort zone loitering, go after what I truly want to create, let my best self shine and cultivate the best me I can be. The nice to have problem I would LOVE to have in 2019 is that my blog is helping so many people that I have to consider retiring from my full time job, despite the generous compensation package and retirement benefits. I want to feel as though I must give the blog all my energy and focus – for the good of others as well as to feel fulfilled myself!